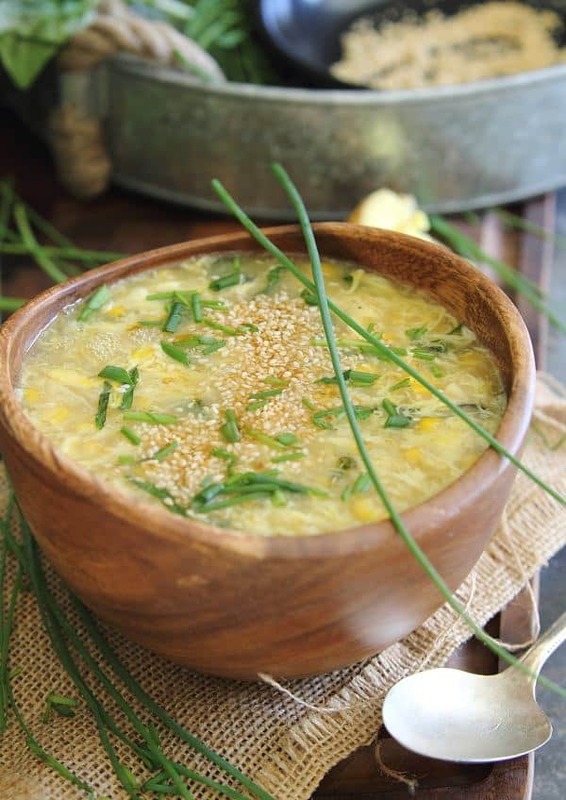 This sweet corn egg drop soup comes together in no time and tastes way better than takeout. I woke up yesterday knowing I was making this soup. But then I started thinking about the photos and none of the 10 million random bowls I’ve collected over the past 3 years were what I had in mind. Which of course meant one thing, a trip to Homegoods. Oh, darn. Since our house sale fell through late last fall and we decided to just stay in this house, Homegoods and I have become bff. The amount of trips I made to that store this winter is disturbing and the amount of money I spent there even more so. But when you sell half your belongings thinking you’re moving and then don’t, you kind of need to replace a lot of stuff. After 4 months of non-stop, weekly, if not more, get togethers we’ve kind of been on a break recently. My wallet needed it and I’m down to two rooms that need stuff; the guest room and the dining room, neither of which we ever go in so on the priority totem pole, they’re pretty low. With that in mind I took our smallest car, a Civic, with the intent to grab a wooden bowl for these photos and get out. I made it halfway back to the register with the bowl in hand before turning around “just to take a peek” at what furniture they had. And then I started freaking out because after months of looking for a storage piece for our dining room and finding nothing that worked, they had like 4 options that worked and were decently priced. The Homegoods panic ensued where I start texting pictures to Ulysses (who of course doesn’t respond) and my mom (who always responds with design advice since she practically lives and breathes all things HGTV) and spend the next 30 minutes debating what to do. Buy it now, pick it up later? Take my chances and come back later? Sleep on it? Walk back to the register and keep my promise to my wallet to not abuse it on this trip? Obviously, I bought it. And after a grumpy husband’s help, it’s now in my dining room where this bowl that started it all will be residing from here on out. Oh, the soup in the bowl? You should make it. 1. It’s pretty much the simplest thing ever. 2. It doesn’t have an entire container of cornstarch in it resulting in that disgusting gelatinous goop you get from takeout. 3. Ginger, sweet corn, basil, chives, toasted sesame seeds and a drizzle of sesame oil…tell me the Chinese food place can compare to that. Want some protein on the side? Make these Chinese boneless spare ribs and have an at home takeout feast! Place the sesame seeds in a small skillet and toast until lightly browned over low heat. Set aside. Mix the cornstarch and 1 tablespoon of broth in a small bowl, set aside. Heat the olive oil in a medium saucepot over medium heat. Once hot, add the ginger and garlic and cook for about 1 minute. 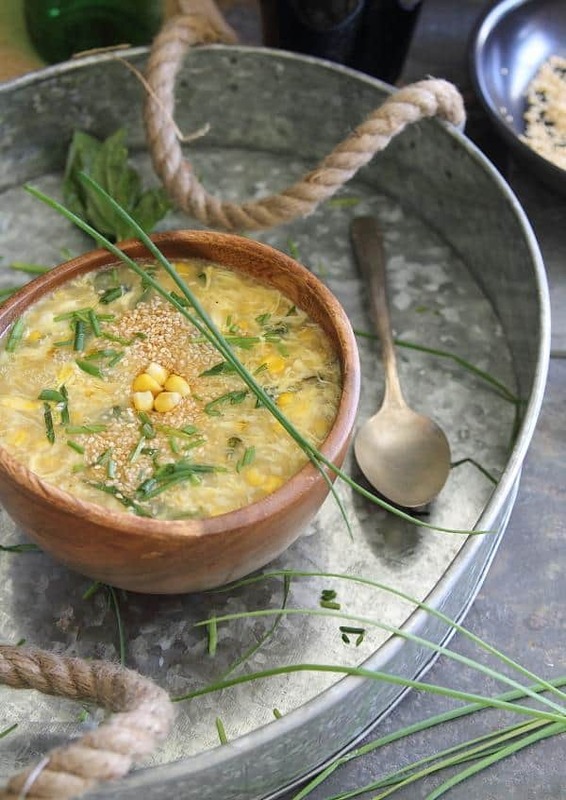 Add the broth and corn kernels, stir and bring to a boil. Once boiling, reduce heat to medium and add the cornstarch mixture. Stir and cook for 5-7 minutes. Turn the heat off, season with salt and pepper and then pour the whisked eggs in while slowly stirring the soup to create long strands. Add the basil and gently stir. 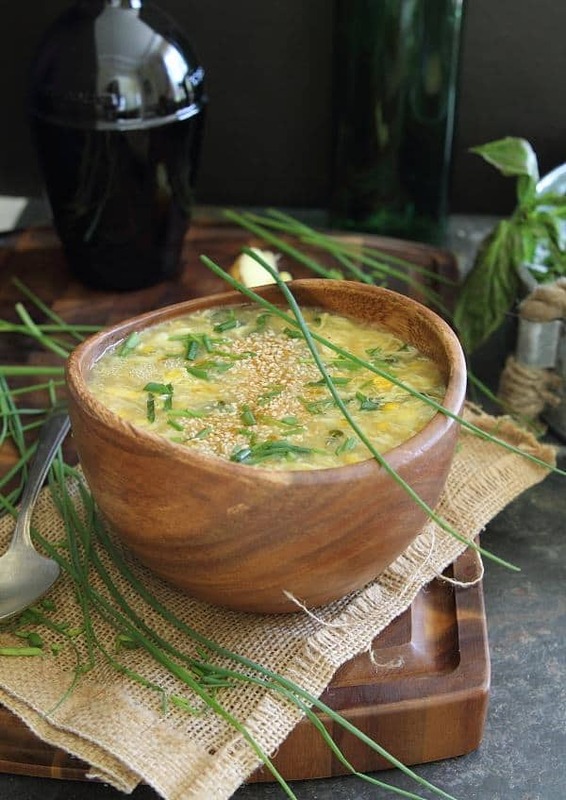 Ladle the soup into serving bowls, top with the toasted sesame seeds, chives and a drizzle of sesame oil. That looks lovely…light and full of my favorite flavors! Gimme. The bowl, the hutch and the soup, please! This is all I ordered whenever I went to Chinese restaurants and the corn makes a perfect delectable! Oh my goodness, love this soup and the bowl!!!! I have not been to Homegoods in a while, this post is making my wallet itchy. Nice take on the soup. 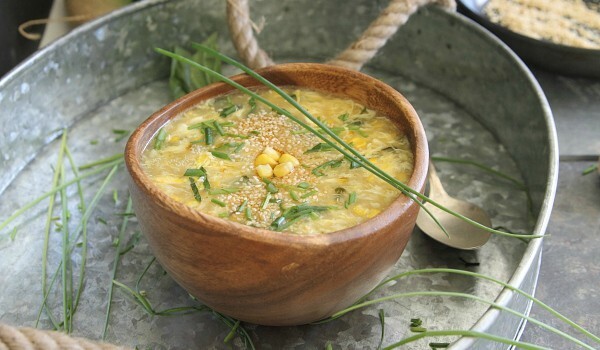 I love me some sweet corn soup. As for Home Goods. I feel you. It doesn’t help that every time I head over there they change their inventory. It’s a never ending wish list! Love the bowl, the backdrop, the pics. I’ve never made egg drop soup before and I’m not too crazy about the take out ones that I’ve tried. This looks delicious! I’ll definitely give it a try! Yum! Thank you for supplying me with a great soup recipe and a way to use up the 10 egg whites I had. After making to recipe I added a bit of salt and tamari. My chicken broth (Trader Joes, packets) is low sodium, so a pinch more was needed. I’ll be making this again! Oops, didn’t mention that I added some Costco rotisserie chicken, too. So versatile! This soup sounds and looks amazing!! It’s going on the menu for this weekend. I just made this soup today and LOVE it!!! I will make this again and again. It’s an easy recipe and the flavor is fabulous! LOVE the bowl….looks like it was worth the trip! And that soup looks fab! I just made this for my 5yo daughter who is very picky eater. She gave me 61 thumbs up!!! Thank you for the great receipt!! !